I begin my advocacy for education as a PTA mom after noticing the immense contributions that teachers made in terms of putting in their own money into classrooms. This prompted me to travel to Carson City during the legislative session, with other concerned mothers and their children, to speak to legislators and remind them of the importance of increasing the funding for our public schools and teachers. As your Assemblywoman, I will support legislation that increases the salary of teachers, reduce classroom sizes, and make changes to the current funding formula that will enable students to reach their full potential. My daughter, Victoria, and I with other students and parents in Carson City in March 2015. We drove from Las Vegas to Carson City to advocate to Nevada lawmakers to prioritize funding for the state school system. 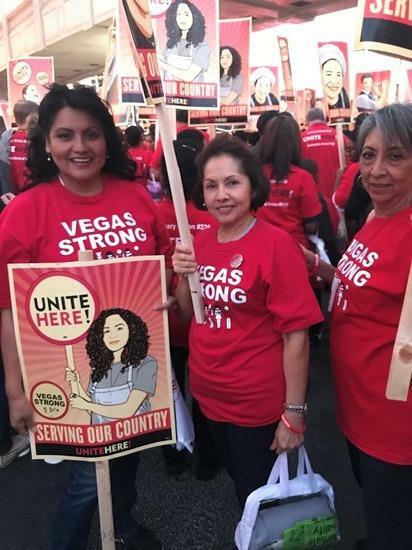 One of my strong priorities in the 80th Nevada Legislative Session is to work my colleagues to ensure that we pass legislation that will increase the standard of living for working families. I am proud to say that I am in favor of raising the minimum wage to $12.00, providing workers with earned paid sick days, and expanding apprenticeship & job training programs. Nevadans want our state to be the nation's leader in clean and renewable energy. That is why I am committed to supporting raising the Renewable Portfolio Standard to 50% to ensure that we continue to diversify our economy by creating high quality and good paying jobs.